Eating gluten free at Christmas doesn't have to be difficult or tasteless. This Christmas, Waitrose & Partners has gluten-free mince pies, Christmas puddings and Christmas cakes, that are so delicious, you won't want to share them with Santa on Christmas Eve! Many turkeys are stuffed and the breadcrumbs in the stuffing often contain gluten. 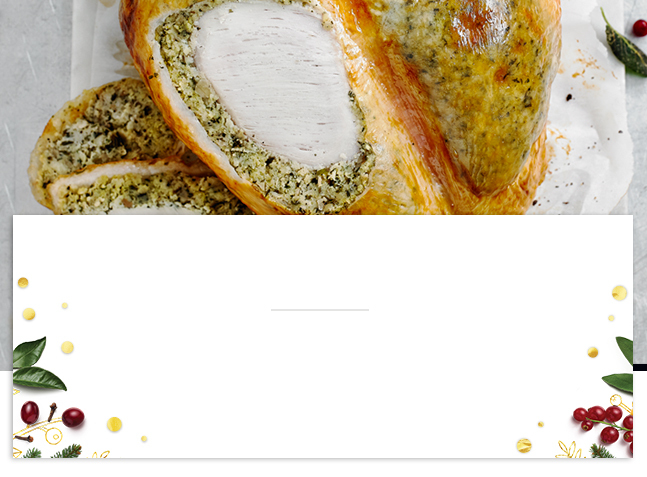 If you or a guest need to avoid gluten, why not try our Turkey Crown with Shallot & Smoked Sage Stuffing, which contains rice and maize flours in the stuffing instead of wheat flour. We also offer a large number of unstuffed turkeys which are suitable for those avoiding gluten. My favourite side dish, roast potatoes, often contain wheat flour in the coating so always check the ingredients if you are buying ready made ones. Any gluten containing ingredient will be highlighted in bold, along with other allergens, in the ingredients declaration on pack. Waitrose goose fat potatoes do not contain wheat flour so are suitable for those avoiding gluten. Yorkshire puddings needn't be avoided this Christmas. Try our Gluten Free Yorkshire Pudding mix for beautifully risen, fluffy puddings. 'Don't miss out on crackers with cheese. Substitute the crackers with oatcakes. They would also make a great canapé for New Years with goat's cheese and a red onion chutney. thenpack into an oven proof dish. a baked alaska with ice cream or sorbet and fresh fruit.